I have been shortlisted for the 2015 Gaby Rado Memorial Award by global NGO Amnesty International. This recognises the work of a journalist who has been covering human rights issues for less than five years. The nomination in particular follows articles I published on Ebola for the Sunday Times, the Observer and the Independent on Sunday. The other journalists on the shortlist are the Independent’s deputy news editor Rob Hastings and freelance investigative journalist Maeve McClenaghan. The winner will be announced at a ceremony at the Barbican in central London on Thursday 26th November. 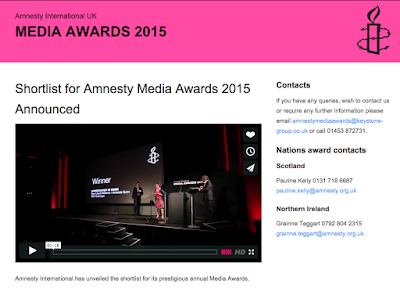 Amnesty’s Media Awards recognise excellence in human rights reporting and acknowledge journalism’s significant contribution to the UK public’s awareness and understanding of human rights issues. Read more about the 2015 awards here.